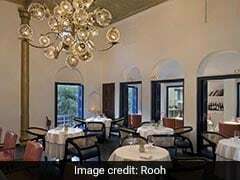 The capital is no stranger to restaurants decked in chic decors offering authentic European and Mediterranean delicacies. 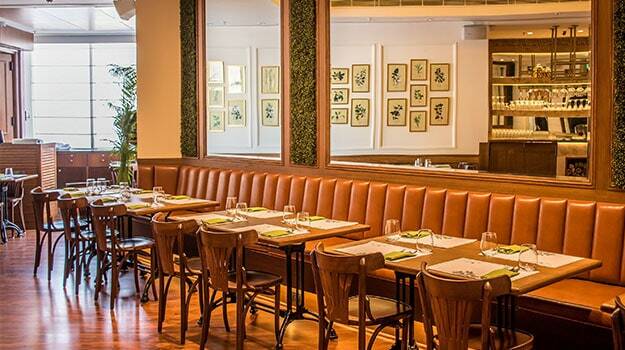 Le Cantine being one of the newest entrants in the league impresses on several counts. 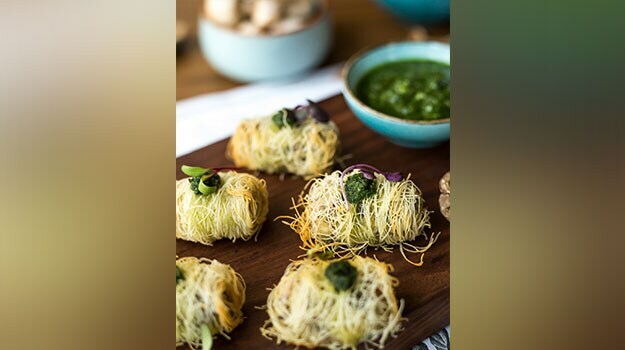 The fine dine-in restaurant situated on the second floor of Delhi's DLF Promenade mall, has many illustrious neighbours in Big Chill, Cafe Delhi Heights and Mamagoto; but the newly launched restaurant holds its own. The charming decor is dominated with a lot of fine wood work and elegant hues of white and gold. The classy bar takes up a huge chunk of the space, but the strategic placing of mirrors never bring to light an obvious space crunch. Another highlight was the white wall dedicated to portraits of exotic herbs from around the world. A little bit of trivia while noshing never harmed anyone, right? 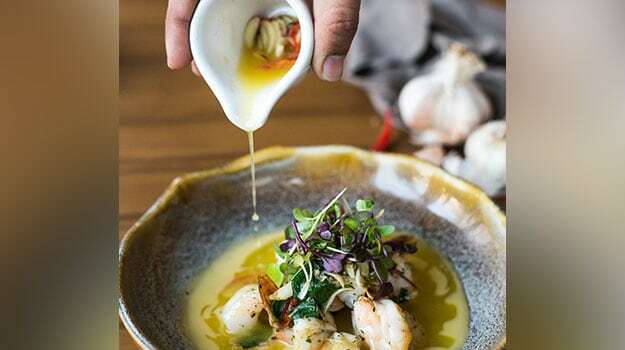 Le Cantine attempts to celebrate modern and classic European cuisine in all its glory. The ingredients used are quite fresh and the flavours are also pleasing. We loved a bit of fusion they attempted here and there too! Who knew chicken skewers would go so well with a fresh pesto topping? Or, that a slice of goat cheese would taste so delicious with caramelised red onions and an orange and cranberry salad? Le Cantine also offers a range of craft cocktails, classic cocktails, artisanal coffee, and tea blends too. The place also boasts of fun baked goods and healthy smoothie bowls. We tried the chilli and garlic butter prawns. Crunchy and cooked to perfection, these buttery prawns came laced in a delectable sauce. The flavours of fresh chilli, garlic and basil are a treat to the soul. Next we tried the goat cheesecake, which has to be one of the most balanced dishes in the menu. 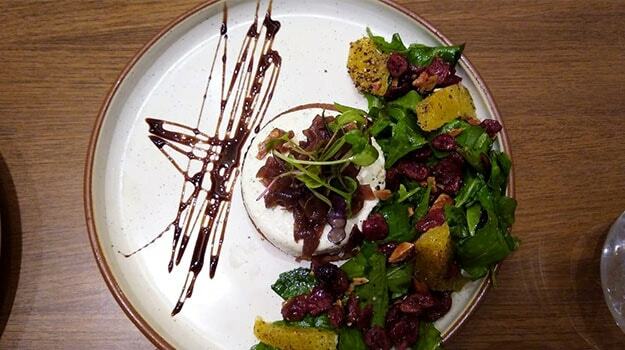 The salty goat cheese chunk is placed on a biscuit-y and crunchy sable, topped with red onion jam accompanied with a fresh and citrusy salad of orange, cranberries an arugula leaves. 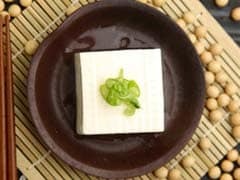 A must try for cheese lovers! We also loved the wild mushroom kaitafi, which was basically an assortment of flaky roll-ups with melt-in-your mouth mushroom and cream cheese filling; however, we do wish the accompaniment was a little more peppy. The kaitafi is served with pesto. The massive portion size of mains seems worth the price too. The spaghetti carbonara was creamy and flavourful; the crunchy bacon bits and black pepper supply ample contrast to the overall dish. We also tried the classic roasted chicken, which was plated alongside generous portions of olives, hashed baby potatoes and sauteed green beans. The chicken was a little hard to cut into; the veggies however were cooked to perfection. We concluded our meal with chocolate hazelnut crunch, which we were told was one of the most ordered desserts of Le Cantine (And we can understand why). The crunchy chocolate pastry comes with a melted chocolate filling and served with corn flakes and a drizzle of chocolate syrup! Chocolate lovers, we heard you slurping!